*With a royal wedding and deadly tornados dominating headlines yesterday, the NFL draft took place in New York without much fanfare, and even included notable boos for Commissioner Roger Goodell from fans bitter about the labor battle. 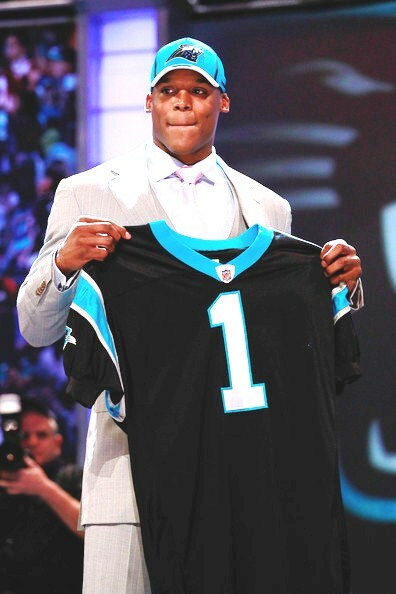 As expected, Auburn quarterback and Heisman Trophy winner Cam Newton was the first pick, and went straight to the worst team in the league — the Carolina Panthers. He vowed to make an impact immediately. Newton led Auburn to an undefeated season and its first national championship since 1957. Before he took the traditional walk across the stage to shake the commissioner’s hand, Goodell had been hearing the displeasure of fans worried that labor strife might interfere with the upcoming season. The boos continued every time he stepped on stage for the early part of the first round, though they died down as the night went along. By the end, there was hardly a smattering of jeers, reports the AP. Thanks to a judge’s ruling in the lawsuit Miller is involved in, the league’s first work stoppage since 1987 temporarily ends today. The 32 teams will resume business in compliance with U.S. District Judge Susan Richard Nelson’s order to lift the lockout. Then again, the lockout could be back in place if the NFL wins an appeal. If that happens, Newton, Miller and the rest of Thursday night’s draft picks would be thrown back into labor limbo. 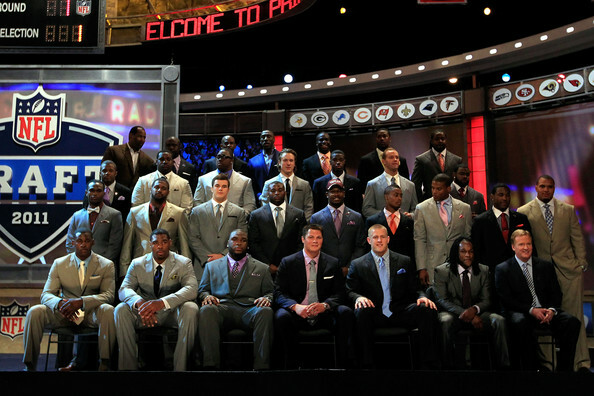 With the third pick, Buffalo selected Alabama nose tackle Marcell Dareus. Cincinnati, perhaps calling the bluff of quarterback Carson Palmer, who is demanding a trade, instead took the top receiver in this crop, A.J. Green of Georgia. 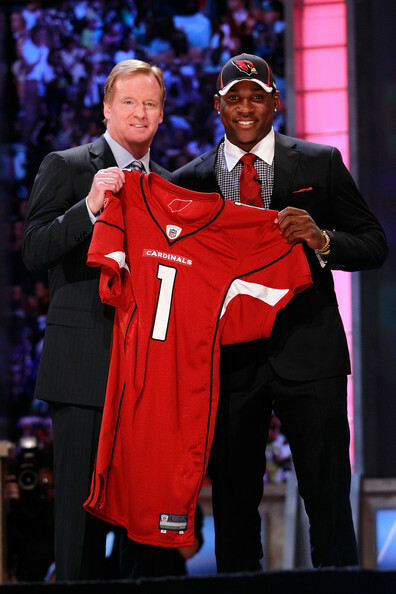 Arizona, also in need of a quarterback, selected the top cornerback available, Patrick Peterson of LSU. San Francisco chose defensive end Aldon Smith of Missouri to bolster a weak pass rush, then the second quarterback was selected: Washington’s Jake Locker, who many thought had played himself out of the first round with an inconsistent senior season, to Tennessee. That began a small run on passers. After Dallas went for offensive tackle Tyron Smith of Southern California with the ninth pick, Jacksonville saw a chance to get its future quarterback. The Jaguars moved up six slots for Missouri’s Blaine Gabbert, dealing their first-round pick and a second-rounder to Washington. Houston bolstered its weak defense with Wisconsin end J.J. Watt at No. 11 before yet another QB was chosen: Florida State’s Christian Ponder went to Minnesota in what was probably the most surprising pick of the first round. Auburn DT Nick Fairley, once projected as a top-three selection, was chosen 13th by the Lions. Detroit took defensive tackle in Ndamukong Suh in the first round last year and he became the defensive rookie of the year. St. Louis, undeterred by Robert Quinn’s lost season — the linebacker-end was suspended from North Carolina for his role in an agents scandal — took him at No. 14. After moving down to No. 16, Washington took Purdue linebacker Ryan Kerrigan. Cleveland traded again, from No. 27 to 21st for Baylor DT Phil Taylor, with Kansas City sliding to 27th. Baltimore passed after using all 10 minutes at No. 26 and Kansas City, in the next slot acquired through Atlanta and Cleveland, swooped in. The Chiefs got Pitt wide receiver Jonathan Baldwin while the Ravens still pondered their pick. They went with Colorado cornerback Jimmy Smith at No. 27. Super Bowl champion Green Bay concluded the 3 1/2-hour first round by taking Mississippi State tackle Derek Sherrod.